Our daughter, Grace, was born was right side microtia and atresia. And while she’s bright and motivated, she does have a unilateral hearing loss; which could mean a potential speech and language delay. Fortunately, her left ear has perfect hearing, but we’ve purchased a BAHA hearing aid and take her to speech and language therapy multiple times a month – just to give her every opportunity for success. Speech and language therapy is typically only thought to be for children who have a hearing loss or speech delay, but it’s occurred to me that the skills our family has learned through therapy are useful to every family. I’ve spoken with several mama friends about the things we learn and practice in therapy – and every one of them has said, “why aren’t we doing this with our kids?” The skills we’ve been taught are really tools to help Grace localize sounds, stimulate brain development, encourage an environment where language can be easy heard and learned, and help her assimilate sounds with basic activities and toys. This isn’t just for families withdealing kiddos with hearing loss. It’s for all families who want their kids to learn, grow and thrive. The therapy sessions are really more of a training session for parents. It’s a time to teach us skills to apply in our daily activity with Grace. 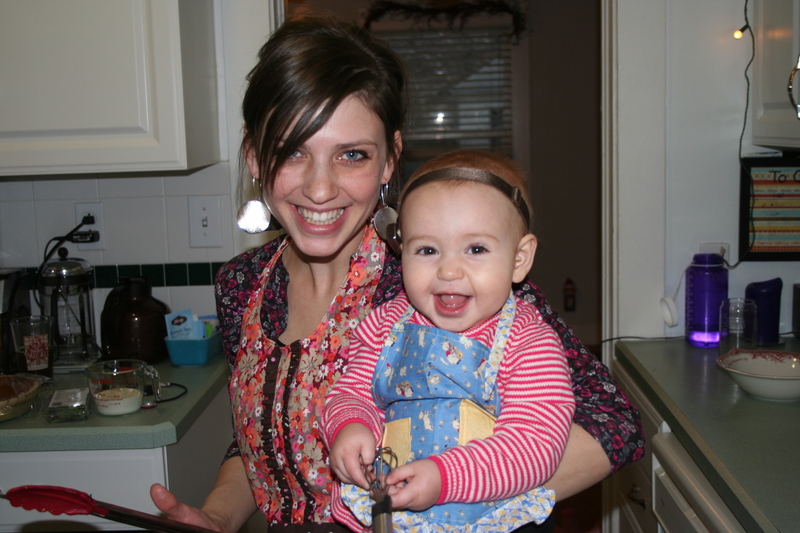 Also, as a first time mom of a now 10 month-old, I have really struggled with how to spend intentional time with Grace. I mean – she can’t hold a conversation, sing a song, understand a story or throw a ball. BUT with my help she WILL be able to do these things. And this is where intentional time with your infant/baby plays a roll. So enough of my babbling. Here are several tools and skills we’ve learned in therapy that I hope all you mamas can use to spend intentional time with your little ones! READ, READ, READ. At 2.5 months our speech and language therapist told us to read 10 books a day to h er. We said, “WHAT! ?” I may totally get this number wrong, but I believe she said that our little ones should be hearing around 40,000 words a day! I talk a lot. But I can’t talk that much to someone who doesn’t talk back. So we read. And read. And read. In fact, Grace could totally care less about toys; but she could sit in a pile of books for an hour. Nerd alert! Or she’s a genius. I’ll tell myself she’s the latter. Quiet. Do you have the TV on all the time? Or the radio? I’m an NPR junkie. I used to have the radio on all the time. But I’ve minimized my radio time for my daughter’s language development. I’m a martyr, I know. This is particularly important for Grace, because it can be difficult for kids with unilateral hearing to tune out background noise. But this truly is important for all kids. Create an environment that will foster room for listening and learning. Your kids aren’t going to learn to speak from NPR’s Morning Edition – much to my dismay. Rich Language. In our latest therapy session our therapist mentioned the term rich language; meaning, to say the same idea in a few ways using different words, expanding ideas and using new words. So as an example, we have a toy cow. I audition before I pull out the toy. “Mooooo. I hear a cow. Do you hear a cow Grace?” I pull out the cow. “Here’s a cow. The cow says ‘Mooooo’.” Then I sit in silence of a bit to see if she has anything to say. Then I sing Old McDonald (using a cow as the animal). I try to prompt her to say what the cows says. Then I may talk about what it looks like for a bit. Then we wave bye-bye to the cow and I put the cow away. Move on to the next animal. The fruits of my labor have only recently been seen. 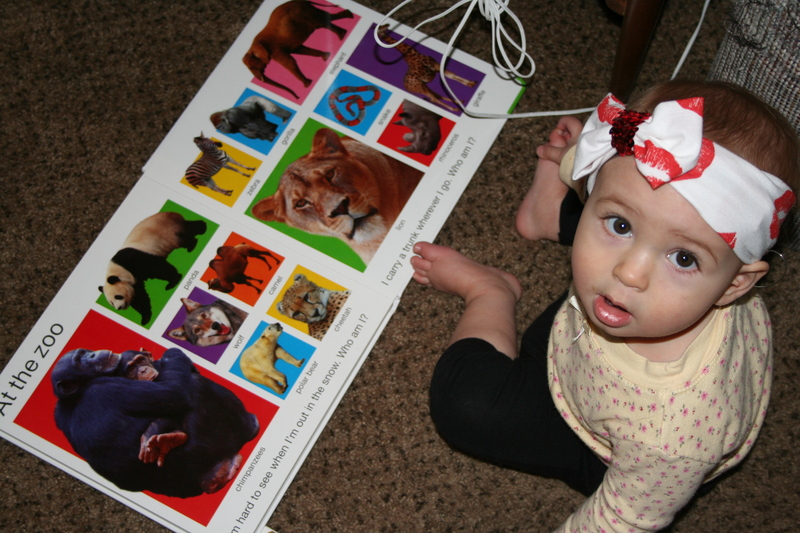 She can now pick out animals – even just by their sound. And with certain animals – like the owl – she tries to make the sound. We’ve begun working on shapes. Eliminate distractions. Grace is busy. Busy, busy, busy. The kid cannot sit still and she’s always moving on to the next toy. So in an effort to eliminate distraction while I’m trying to spend intentional time with her, I keep her toys in her toy box hidden from view and pull out one at a time. After we’re done we wave bye-bye, as mentioned above, and move on. Encouraging kids to learn and grown in language and listening at a young is important for ALL families – not just families dealing with a hearing loss. I hope these suggestions can help you spend quality, intentional time with your littles! This entry was posted in Family and tagged BAHA hearing aid, hearing loss, microtia, rich language, speech and language therapy, unilateral hearing loss. Bookmark the permalink. Haha, nerd alert! This is a great entry, I’ll be sure to spend more intentional time with Sawyer.